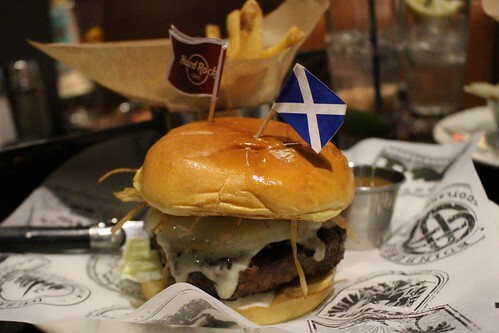 I don't even know how many years it's been since I stepped into a Hard Rock Cafe, but when I heard from Deep End Dining that the Boston location is offering a haggis burger during the World Burger Tour promotion, I decided I had to try it! I didn't know this before, but each Hard Rock Cafe location has their own unique burger, dubbed Local Legendary Burger. During the World Burger Tour, which is happening now until June 30, the Hard Rock Cafe locations in the USA will be showcasing different local burgers from all around the globe. Each US cafe will feature four different burgers, and the menu will vary from cafe to cafe. 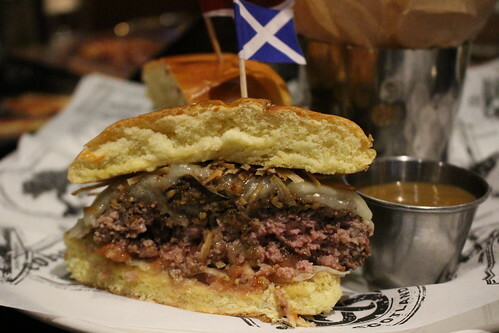 Of course, I tried the Haggis Burger from Edinburgh, Scotland. It's a beef patty topped with haggis, Monterey Jack cheese, golden turnip frazzles, whiskey maple glaze, lettuce, tomato, served with fries. They even got the nips and tatties in there! That's turnips and potatoes, if you didn't know.